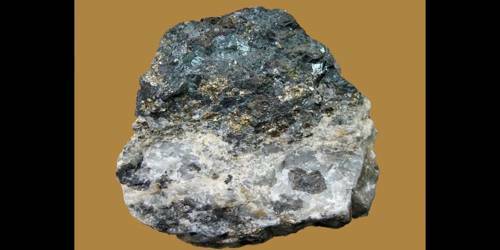 An important ore of silver, it is found in moderately low-temperature hydrothermal sulfide veins and in zones of secondary enrichment. Its name comes from the Latin “Argentum” meaning “silver.” This form of acanthite is occasionally found as uneven cubes and octahedra, but more often as dendritic or earthy masses, with a blackish lead-grey color and metallic luster. Characteristic is the ease with which it is cut. Argentite is stable only above 179 deg C; thus, although few crystals found appear outwardly to be isometric, they are actually composed of acanthite, a chemically identical paramorph belonging to the monoclinic system. Argentite’s hardness is 2 – 2.5 and specific gravity is 7.2-7.4. Habit: Arborescent – “Tree like” growths of branched systems (e.g. silver). Habit: Blocky – Crystal shape tends to be equant (e.g. feldspars). Habit: Skeletal – Crystals form crude outlines with missing faces. It occurs in mineral veins, and when found in large masses, as in Mexico and in the Comstock Lode in Nevada, it forms an important ore of silver. The mineral was mentioned in 1529 by G. Agricola, but the name argentite was not used until 1845 and is due to W. Haidinger. Old names for the species are Glaserz, silver-glance and vitreous silver. 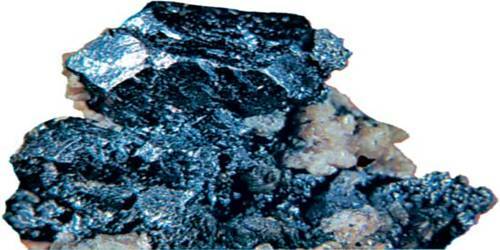 A related copper-rich mineral occurring e.g. in Jalpa, Zacatecas, Mexico, is known as jalpaite.